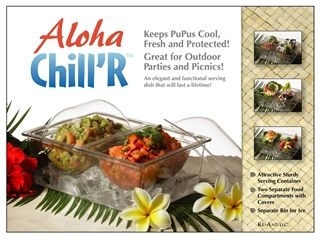 The Aloha Chill’R consist of three (3) compartments, the bottom pan that holds the ice, the inner compartment with two (2) cavities that holds your food & pupu’s, and the two (2) dome covers that keeps the flies & bugs out. The Aloha Chill’R measures approx 10 ½” in length, 7 ½” in width, 4” in height, with two (2) 2 ¼” tall dome covers. When storing, the dome covers nest snugly into the inner compartment cavities.